If you burn incense at home regularly you may be putting your children at a risk of developing cancer or lung problems. TOTOBOBO mask may be the only practical solution for children who cannot avoid exposed to the harmful incense smoke in many Asian cities. Smoke particles from burning incense were found to cause cancer of the upper respiratory track. A 12 years long “Singapore Chinese Health Study” of more than 61,000 ethnic Chinese adults living in Singapore discovered ‘Among non-smokers who used incense during the day or at all times, the increased cancer risk was three times that of smokers.’ said Prof Koh Woon Puay of National University of Singapore. The best way to avoid such risk is not to burn any joss-stick. 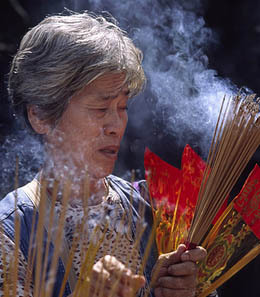 However, incense has a significant meaning in the minds of many Asian cultures such as Hindu, Buddhist or Taoist. Mr Chung Kwang Tong, secretary-general of the Taoist Federation Youth Group in Singapore, explained that for Taoists, the smoke from incense is a way of communicating with the deities. Even for those who don’t practice any of these religions, may have inhaled incense smoke involuntary. Children are particularly at risk, there is mounting evidence that exposure to air pollution has long-term effects on lung development in children. If stop burning incense is not an option, then protecting the vulnerable children with a face mask should be the second best option, right? 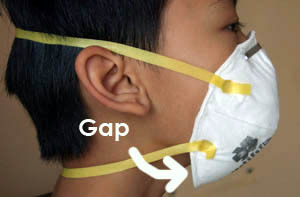 To filter out the harmful smoke effectively, a face mask must produce two conditions simultaneously. First it needs to seal the user’s nose and mouth snugly. Second the filter material must be able to filter out those fine smoke particles. The use of simple surgical mask doesn’t help, as air-leaks are all around the face and smoke can easily by-pass the mask to enter the lung. Upgrade to an N95 respirator can help, only if you have access to a fit-test setup to ensure the mask is making a proper fit. 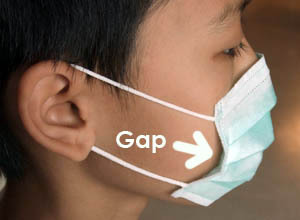 Otherwise, if air-gaps exist in an N95 mask, it makes very little difference from using a cheap surgical mask. Buying an N95 mask is easy, but getting it fit-tested is not. Much to disappointment, there is no N95 mask available for children. TOTOBOBO mask can be cut to fit children (and adults), and parents can now fit-check the mask without the need of expensive fit-test equipments. The name TOTOBOBO (totobobo.com) suggests the solutions in Chinese: TOTO (transparent) BOBO (protection for baby). Parents can see through the transparent mask to examine the seal on the children face. We compared the visual fit-check method with a high-end fit-test setup call Porta-Count in hospital. The result shows strong correlation between the visual-check method and the official fit-test. “User seal-check has never been able to reach such accuracy. It is possible to ensure protection by simply looking through the mask. 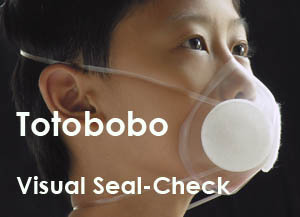 It looks like TOTOBOBO mask is going to provide the much needed alternative to surgical masks or disposable N95 mask, especially for children suffering from incense smoke or other air pollution. Yes, that clearly will do a much better job of protecting our kids from pollutants. Thanks for sharing! Pingback: How to reduce school bus pollution for your children?